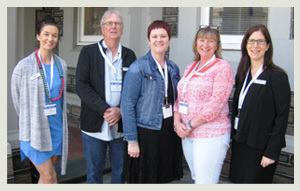 Congratulations to the five lucky teachers who received sponsorship from the TRB to attend the conference. Held at PAC at the end of September, the conference offered a range of presenters and workshops for delegates to enjoy as well as plenty of networking opportunities. To learn more about the sessions and highlights from the conference, read the delegate conference reports on our website. Only 24 renewal days left until Christmas! As the school year winds down, the renewal of registration period is rapidly coming to a close. So, if you’re due to renew (and haven’t), put renewing your registration at the top of your to-do list to make sure you beat the 31 December deadline. The Peer Support Implementation Workshop (9am-4pm, Tuesday 24 February, North Adelaide) is an interactive, full day of professional learning which provides teachers with the tools to coordinate an effective Peer Support Program and confidently train their Peer Leaders. Our office hours are from 9:00 a.m. to 5:00pm Monday to Friday.